﻿﻿﻿﻿I’m feeling ancient, not old, but genetically connected to ancestral traditions—hunting, cleaning skins, cooking over an open fire. And, although my Keltic roots may be showing, I’m not alone in these primitive longings at this time of year. 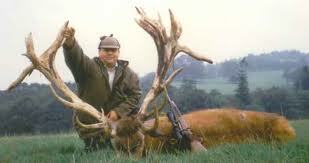 There’s a bit of the hunter/gatherer in all of us. For example I’ve got a friend who’s techno-smart and on the hunt, he organized a band of bargain hunters who camped outside all the big stores in the Sacramento area on Thanksgiving night, temperatures below freezing to bag the best deals, antlers and all. ﻿ ﻿﻿Their prey? Gadgets at deep discounts. They texted through the night, gathered orders from friends and family and, armed with a long list of electronics, at daylight they busted through the doors of WalMart, Best Buy and Target, running for the bargains. One guy snagged a $15 toaster for four bucks. Being a woman on a budget with a four-slot toaster already in my kitchen, my mind is not on this kind of sport, instead I’m intent on trophies of another sort—those that come from the stove to give as gifts for family and friends. My pursuit of the best holiday baked goods is helped along by the ancient wisdom found in favorite cookbooks, on Web sites, blogs, and word-of-mouth, one woman to the next. • North Pole Cookie Dough – Studded with chocolate chunks, nuts and marshmallows, the buttery chocolate cookie dough is packaged uncooked and then frozen. 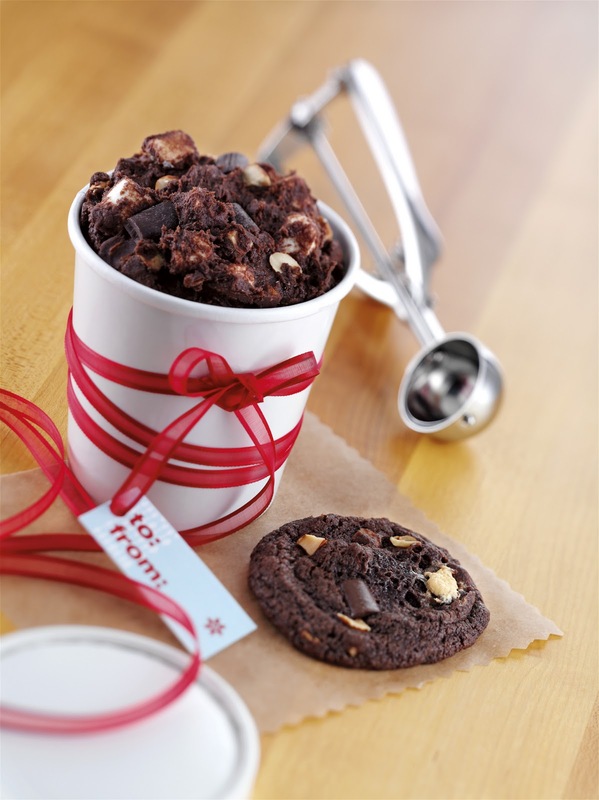 The recipient can thaw it weeks or months later and bake up a batch of cookies when they feel like it. • Penuche Pumpkin Cakes – Rich pumpkin cake topped with buttery penuche fudge and pecans, half candy, half cake. Bake in individual jars, jazz up with a festive ribbon and a label – one of several free downloads available on the blog. * If you cannot find apple pie spice, substitute 1/2 teaspoon ground cinnamon, 1/4 teaspoon nutmeg and 1/4 teaspoon allspice. Pour cider into small saucepan and simmer over medium heat until reduced to 1/3 cup; approximately 35 to 40 minutes. Set aside to cool. Line 8-inch square pan with buttered parchment paper or aluminum foil. In small bowl, combine heavy cream, salt, apple pie spice, cinnamon and reduced cider; set aside. In large, heavy-bottom saucepan, combine sugar and corn syrup. Cook over low heat, stirring until sugar dissolves. Insert candy thermometer and simmer until syrup reaches 234°F. Remove from heat, remove thermometer and very slowly whisk in cream mixture (mixture will foam and may spatter). Add cubed butter and stir or whisk until cream and butter are fully incorporated. Return pan to heat, reinsert thermometer and cook over low heat, stirring frequently, until temperature reaches 250°F. Remove from heat and pour caramel into prepared pan; let mixture cool slightly, then sprinkle with freshly ground cinnamon or sea salt, if desired. Cool completely at room temperature or refrigerate until set. Once set, remove caramel from pan lifting out by parchment paper or foil. Cut caramel into 3/4-inch squares. Wrap each piece in small wax paper square, twisting at each end. Store caramels in airtight container in cool place or refrigerate up to 2 weeks. A Creative Candy Cone – To recreate this package, find some festive paper at a craft or scrapbook store, roll it into a cone shape, then tape it shut at the seam. 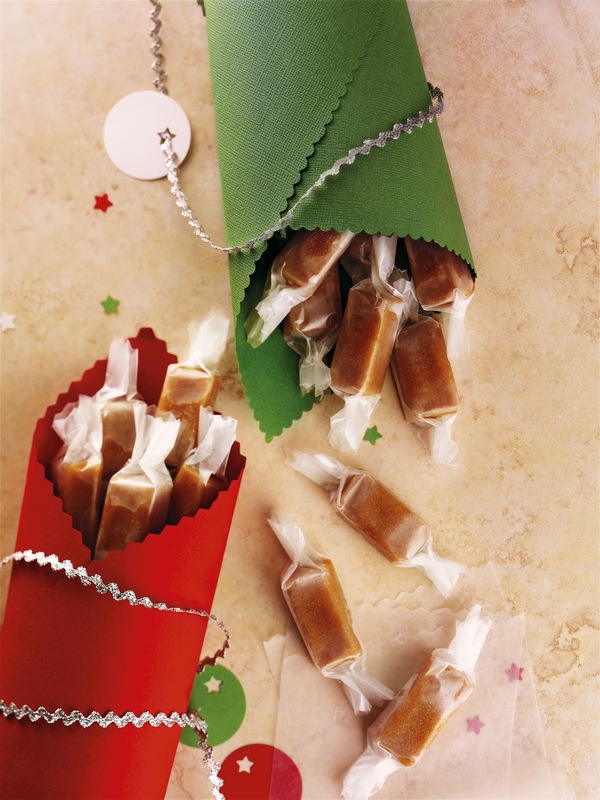 Add ribbon or other decorations and then fill the cone with these sweet little waxed paper-wrapped candies. Visit the blog at TheGiftofGoodness.com and Web site ButterIsBest.com (Whether butter is best is debatable every month of the year, except December when it’s totally OK!) to find more holiday cookie and candy recipes. 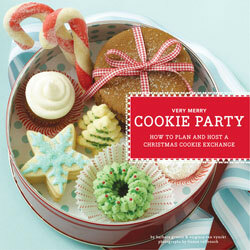 Another source for homemade gift ideas is Barbara Brunes and Virginia Van Vynckt’s new book from Very Merry Cookie Party How to Plan and Host a Christmas Cookie Exchange, $19.95 from Amazon.com. We just made cookies over at Christine's yesterday–a 30+ years family tradition. Thanks for the yummy links!